(CNN) -- On the one-year anniversary marking the crash of Air France Flight 447, which killed 228 people when it fell into the Atlantic Ocean, victims' families will push for more thorough searches and more evidence, a family activist said Monday. 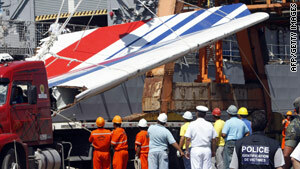 The Airbus A330-200 crashed into the ocean as it headed from Brazil to France, in one of Air France's worst tragedies. A series of ceremonies will take place in Paris on Tuesday; a Mass was held Monday in Rio de Janeiro. Brazilian businessman Martin Van Sluys, who has traveled the same Rio de Janeiro-Paris route numerous times to meet with French officials, said he will not give up his fight for a comprehensive report that can explain the causes behind the crash that cost the life of his sister. "I keep thinking to myself as I travel in these planes, this could be me one day, this could be my son. There are so many planes flying around that could have the same issues," said Van Sluys, who acts as spokesman for families of the crash victims. According to Brazil's air force, on May 31, 2009, the crew of AF Flight 447 made their last contact with Brazil's Atlantic Control Center (ACC) at 22:33 GMT, informing the center of the plane's position as it crossed the Atlantic. Soon after, Brazil's air control contacted Dakar's control center in North Africa and reported that AF 447 was entering an area on its route known for constant bands of severe turbulence, officials said. There was no further contact with the plane. In the months following the crash, investigators moved through three separate phases of the incident probe. In May, France' air investigation agency, BEA, announced the end of the third phase of its investigation without citing a specific cause of the crash. The plane's "black box" flight recorder remains missing in the ocean, according to Air France. "We have demanded a fourth phase," said Van Sluys. If financially-troubled Air France commits to a fourth search phase that would cost the company millions of euros in personnel time and resources, company officials may come close to meeting some of the victims' demands, Van Sluys said. "My objective is to see a final report with concrete evidence," said Van Sluys. "We know how costly the truth could be to some of the interest groups behind these investigations, from the manufacturers to the suppliers." "But what keeps me going if this had happened to me, my sister, who was a journalist and never accepted injustice, would have done this for me," he said.